Finally, the Phillies full squad began their spring workout. 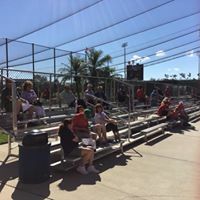 Sixty-three players took to the fields at the Carpenter Complex Monday morning in front of a sparse crowd. In another break from recent tradition, the players broke up into groups on three fields for stretching and throwing. Even this start of the day was not without some confusion for fans. Well me at least. The groups started at differing times and ran through their program in a different order. When they broke into their on field drills, they were run in a more haphazard way than in previous days. 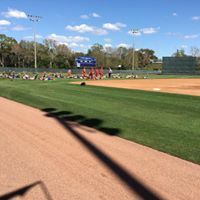 Position players ran the bases on two of the fields. Those on Schmidt Field ran at full speed while those on Ashburn seemed to run at less than 100%. PFPs (bunts) were run on two fields with infielders manning the positions instead of staff. Pitchers spent a lot more time watching as the groups were twice as large as last week. Outfielders took balls on a hop and threw to bases or home plate. The coach ran several reps to each field while the players in the other two fields just stood and watched. Odubel Herrera stayed in the infield to catch balls at the mound for the coach hitting the balls. Seemed like a “great” use of your starting center fielder. Not to mention all the down time for the outfielders. Catchers ran through some drills in RF of Roberts. One had them in a normal squat with their glove hand on the ground completing a three-point stance. They switched from from their glove hand to their free hand while maintaining their balance. Pitchers threw live BP on 3 fields with umpires behind the catcher. Batters swung freely. One player lifted a ball over the scoreboard on Roberts Field. Later, the outfielders ran through a drill with a fly ball machine launching multiple balls to outfielders at the same time. This was similar to the multiple pop up drill that they ran with catchers last week. There seemed to be a lot more wasted time than last week. And most of the time it seemed that only three fields were in use. I spotted Coach Thomson, who is running camp, viewing the drills from the second floor of the club house. Hopefully, the pace picks up tomorrow. Jason Kelce was invited to talk to the team before they came out for the workout. 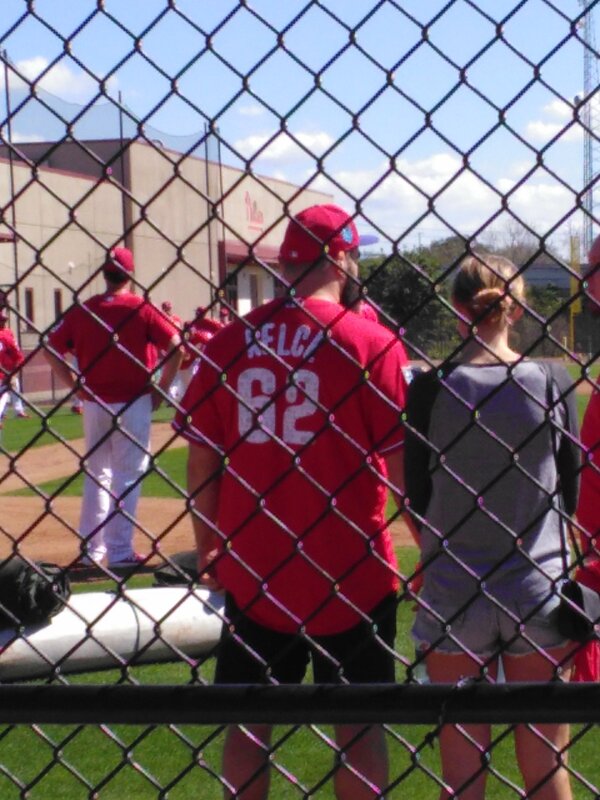 He wore a #62 Phillies jersey. After the Phillies are finished, the minor leaguers who are in town begin afternoon workouts around 1:00 PM. These guys follow a more traditional set of drills, one I am used to. I hope it continues when they begin in earnest next week. There are a lot of players at the Complex already, at least 35 so far. They aren’t due until March 1st. Among the earliest spotted were – rehabbers Mario Sanchez, Kevin Gowdy, Grant Dyer, and Sutter Mcloughlin. As well as, Ryan Etsell, Ben Brown, Kyle Young, Garrett Cleavinger, Seth McGarry, Zach Warren, McKenzie Mills, Jeff Singer, Austin Davis, Carlos De La Cruz, Drew Stankiewicz, Jiandido Tromp, Dalton Guthrie, Tyler Viza, Nick Fanti, Zack Coppola, and Cole Stobbe. And more recently, Connor Seabold, Mickey Moniak, Will Hibbs, Jonathan Hennigan, Zach Green, Jo Jo Romero, Trevor Bettencourt, Abrahan Gutierrez, Henri Lartigue, Tom Windle, Deivi Grullon, Jacob Waguespack, Shane Watson, Austin Bossart, Cornelius Randolph, Aaron Brown, and Cord Sandberg. It looks like Moniak has added some muscle. He appears to have bulked up some over the off season. I saw some video of his first BP (3 swings). His bat looks faster through the strike zone with a more lofted angle on his swing. Three swings is a SSS, so I’ll make it a point to get a live look this week. Stobbe looks much bigger across the shoulders, too. 2018 ST Roster – Nick Rickles and Drew Hutchinson are additions who aren’t on this original version. As is Fernando Abad. Phillies are talking with Arrieta. Fingers crossed! Take it or leave it Jake, the Phillies are good with or without you. Yup. That’s pretty fair. Four years, if they need to be done, will not be crippling. People are overreacting to anything for more than three years. Count me in the camp that the Phillies should not sign Arietta. Don’t think 3 yrs will get it done unless they offer astronomical AAV. I’d offer Darvish total dollars over 4 yrs, again front loaded. Even if his numbers are worse than last year, he would’ve still been the second best pitcher on the Phillies. I love how three years is ok, but stay far away from 4 years. Why? If you really believe someone is going to be good for three years and horrible the fourth, it’s still worth it. The end of Halladay and Lee’s contracts did not prevent us from signing anybody. The only reason why everyone is so afraid of an extra year as being an albatross is because of the Ryan Howard deal. We knew it was a bad extension when it was signed two years early for no reason. And if we just admitted defeat and cut him, we would’ve been over it and it would’ve been long forgotten. Phillies need wins. Phillies need to show improvement to show next year’s free agent class we are serious contenders. Signing Arrieta will help that immensely. So we have to lay him a few million extra every year AND tack on one more year beyond comfort. That doesn’t matter. It won’t prevent us from signing big ticket free agents. Going “cheap” and passing on Arrieta only so we can over-pay on a big free agent next year makes zero sense. I’d rather be “stuck” with Arrieta for an extra year than have to over-pay for, say, Harper on a 10-year deal where he might be useless the last 4 years. And you people getting hung up on money. Why!?! If Arrieta gets $28M versus $22M, what difference will that make? The Phillies have proven they can hang at the luxury tax limit….and that was before the Comcast deal!!! And if you go over the tax limit, what happen So? Do you die? No! You pay a penalty. If the Phillies are postseason contenders and have the opportunity to add Mike Trout, but it puts them $10M over the luxury limit, do you think they will shy away because of the 20% penalty? That is such stupid logic. Right now, Arrieta is the best option. People like Duffy. That’s fine. But I’d rather pay $8-10M more a year for Arrieta and keep the prospects it would take to acquire Duffy.
. Prefer 3 or less. I’d let him do a pillow contract, but I don’t think he’ll sign that. 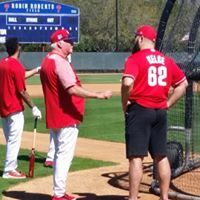 In a lot of ways the phils are setup nicely to make a good run, between the current roster, the farm, and the bankroll for FA… it’s basicslly autopilot. What the FO will decide how long that window stays open. I can be patient for season, but I’ll take arrietta with the thought they accelerate the process enough to have a legitimate shot at the playoffs, as a WC. Enjoy the ride folks, spring training is here, and this team is only going to get better and better in the coming years. Ha … someone read my story time. Just for this site, I will. I’ll have story time part 2, stay tuned! lol .. that was an awesome game. Tac, either you pass on him or you take him for 3, possibly 4 years. Which is it? We had 66 wins last year. A jump to 81 is a huge jump. Without adding an above-average pitcher, I’m not so confident 4 guys will all step forward and improve on their collective 5.00+ ERA’s. If we are not .500 or really on the upswing and close to it, I can’t see any big ticket free agent wanting to come here. Why will machado or Harper (just using those two as an example) want to come here and maybe win in a couple of years when they can STILL GET PAID, and go to the Yankees or Dodgers and start winning immediately? For me I believe the young stRters will develop enough this year, take enough strides forward in combination with the improved offense&bullpen …that they don’t really need arrietta…. to make a WC run. Not a homer, just optimistic and I’m basing this off last year’s second half + off season additions. With that’s said, because they have so much payroll flexibility, I’m not going to whine if they do sign him. I can give up one rotation spot for the potential/leadership he will bring, but … I’m not super crazy about it. I don’t think either path has that much of a negative effect on 2019 and beyond, so I’m ok with either. If that wasn’t the case, id be very against it. Those are fair points. The only problem I have is the difference between being a homer and being optimistic. I think the line is a little blurred for you. A wild card run without another quality pitcher? I disagree. I don’t agree that Arietta will “help immensely” for the Phillies to show improvement in 2018. You state that like it’s a sure thing. It’s not. So yeah, I stand by my “immensely” prediction. If they can’t land Arrieta or Cobb, I’d rather stand pat. almost as tall as romus. rocco…the kid could be one of those great UDFA stories that legends are made of..
Perhaps the best thing about this video are the shots of a very filled out, stronger and grown-up looking Mickey Moniak standing in the foreground. Now THAT is encouraging. yes….Jim Peyton did say he looked more fuller around the shoulders this spring. The added muscle/strength perhaps will translate at the plate this summer. I hope so Romus, I am rooting for him to have a great year. He does not have to show me he should have been the 1st player picked, he just needs to show me he will be a Major Leaguer. Excellent post, Matt. If he can slash .280/.340/.460, with 15 HRs, he’ll be a valuable MLB player, whether it be here or elsewhere. I was definitely disappointed in his 2017 but hearing the kid interviewed a few times impressed me by his maturity. If he came across like a space cadet, I’d be concerned. Either way, he’s what? 20? He’ll be a top story line in the minors this season. I’m pulling for him as well. Seems like a nice enough person from what I’ve seen. To have those expectations at a young age, you have to root for the kid… it’s a shame when an Appel happens, you don’t wish that on anyone …. well except Mets and Braves prospects, it normally you feel for the guys. It’s a big year for him to start breaking through, I’d be happy with an above avg season, he doesn’t have to blow out the competition for me to be a believer, just start heading up the hill, making the climb. Hopefully him and Hasley can on a collision course, will bump the trade values. Michael Saunders signed minor contract with Pirates. The posts are fun to read and the photos/films fun to watch. Baseball is back as is the freshness and optimism of spring. Great stuff! I’m pumped, always excited in spring training .. you just never know when a 1993 season is upon us … worst to first? … yes it’s not overwhelmingly likely, but it Could happen. To the negative Nancy’s , calm down it has happened before and continues to happen, a few lucky injury breaks here and there on the nats and you might be singing a diffferent tune. Looking forward to baseball again. It’s been a long, cold, lonely winter. Worst to first continue to happen, huh? In the 24 seasons since 1993, how many teams have gone worst to first? I suppose if Scherzer, Strasburgh, Murphy, Eaton and Harper get injured, it’s possible another team wins the division. But that doesn’t guarantee it will be the Phillies. The real question is whether they can contend for a WC spot. I expect the offense to be pretty good, perhaps even very good. But to compete for a WC spot they are going to need much better starting pitching than last year. That’s probably going to take at least one good veteran arm and a lot of improvement from the current younger players. It would be nice to see them a bit above .500 at the AS break so we can have an exciting season at the very least. This team hasn’t had any shot in hell of a playoff spot since 2012 (and then only a fleeting outside chance for a week or two0. From 2013-17 they were out of it by June or earlier – that’s a lot of meaningless baseball and I’ve more than had my fill of that, thank you. Six years with 545 losses worth of futility.